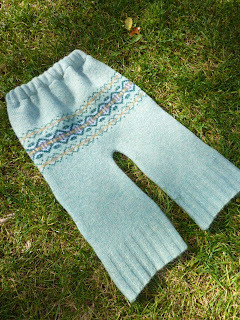 Years ago I read about making Christmas stockings from old sweaters, now called upcycling. (I guess they assume the sweaters left something to be desired, so to be made into stockings would be an upgrade.) There are several tutorials online, and even a yummy felting book with the pattern pictured here. Another thing I like to get at thrift stores? Baby toys, like little rattles to keep Olivia busy at a restaurant or in the car. They're only a quarter so if we lose one it's not a big deal. OJ doesn't care if someone loved them before, and I just run them through the dishwasher or washing machine before she gets them.